“Sweet Caroline” is one of those enduring songs which many of today’s “baby boomers” remember from their childhood or teenage years. Perhaps just hearing it brings back a memory for you? Please enjoy this video and the Sweet Caroline lyrics below it. If you’re interested, take a look at some of the background facts to the song, below the lyrics. Feel free to add your own comments if there’s anything else about “Sweet Caroline” that you’d like to share. Who’d have believed you’d come along. We fill it up with only two. “Sweet Caroline” is a song written and performed by American recording artist Neil Diamond and officially released on September 16, 1969, as a single with the title “Sweet Caroline (Good Times Never Seemed So Good)”. It was arranged by Charles Calello, and recorded at American Sound Studio in Memphis, Tennessee. The song reached #4 on the Billboard chart and eventually went platinum for sales of one million singles. 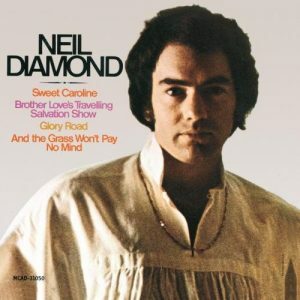 In the autumn of 1969, Neil Diamond performed “Sweet Caroline” on several television shows. It later reached #8 on the UK singles chart in 1971. In a 2007 interview, Neil Diamond stated the inspiration for his song was John F. Kennedy’s daughter, Caroline, who was eleven years old at the time it was released. He sang the song to her at her 50th birthday celebration in 2007. On December 21, 2011, in an interview on CBS’s The Early Show, Diamond said that a magazine cover photo of Caroline Kennedy as a young child on a horse with her parents in the background created an image in his mind, and the rest of the song came together about five years after seeing the picture. However, in 2014 he said that the song was really about his then-wife Marsha, but he needed a three-syllable name to fit the melody. The song has proven to be enduringly popular, and as of November 2014 has sold over two million digital downloads in the United States. The playing of “Sweet Caroline” has become a fixture at many sporting events in the United States. In this version, the horn figure after Diamond sings “Sweet Caroline” in the chorus is replaced by the crowd singing “Oh, oh, oh”, and after he sings “Good times never seemed so good,” the crowd sings “So good, so good, so good.” This pattern is repeated whenever the chorus is played. On April 25, 2013, “Sweet Caroline” was played following a tribute to the victims of the Boston Marathon bombing during the NFL Draft. Diamond has announced that he will donate all royalties from sales of the song since the marathon bombings to the One Fund Boston charity to help the people most affected by the bombings.